Fort Casey (1890-1950) - In 1890 the U.S. Army established its garrison at Fort Casey and in 1897 expanded the post with a additional 123 acres of land. Construction on the gun batteries began in August 1897. The post was named in G.O. 134, 22 Jul 1899, for Brigadier General Thomas Lincoln Casey (Cullum 1536), U.S. Army Chief of Engineers (1888-1895). 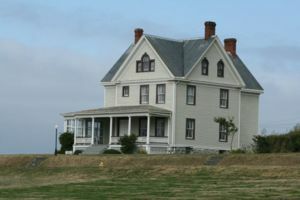 The Fort was officially activated in 1900, placed in caretaker status in 1950 and acquired by Washington State in 1956. Part of the Harbor Defense of Puget Sound. Fort Casey, with Fort Worden and Fort Flagler, comprised a "triangle of fire" guarding the entrance to Puget Sound and the Bremerton Navy Yard as well as the cities of Seattle, Tacoma and the State Capitol at Olympia. Fort Casey was built as an Endicott Period coastal defense fort. A small detachment of troops from Company B, 3rd U.S. Artillery, arrived on the reservation at 3 pm, 8 Sep 1899, to establish the post per S.O. 171, Hq Department of California. The first garrison numbered thirty-two men under the command of 2nd Lieutenant Alfred B. Putnam (Cullum 3875), 3rd U.S. Artillery. Fort Casey was officially activated in 1900 but the first five gun batteries were not accepted for service until 1902, two batteries were accepted in 1905 and the remaining four were accepted in 1907. Fort Casey received its first full garrison on 19 Jul 1902 when Companies 63 and 71, Coast Artillery, arrived from Alcatraz Island with 203 men under the command of Captain Joseph P. Tracy (Cullum 3680), Artillery Corps. The post was initially designed as a small three company coastal fort with the main post north of the main gun line and the mortar batteries. Most of the permanent buildings were complete and accepted on 25 Apr 1904. This initial set of buildings included six sets of officer quarters with a capacity of 11 married officers, a small single-story hospital and a couple of married NCO quarters. The small hospital was upgraded and expanded with a second story in 1906. Two CAC 109 man barracks were built and a third was added in 1905. More quarters and support structures were added between 1905 and 1910 but with the completion of the power plant in 1910, the post was virtually complete. The post arrangement was that of an open plan coastal fort centered around a large parade. Officer housing lined the north end with the enlisted barracks on the south end. Administrative and supply buildings formed the east side and the Straits of Juan De Fuca formed the western border. NCO housing was on a diagonal from the northeast corner of the parade. The main gun line was further south of the enlisted barracks along the Straits. During World War I Fort Casey was used as a training post. A large number of temporary buildings were built in a cantonment behind the permanent barracks near the mortar batteries. These structures are shown on the 1921 plan of the fort. The temporary structures were removed sometime in the 1920s. After the war, the post was placed in caretaker status and used by the National Guard for training camps. The post deteriorated significantly under caretaker status and by the mid-1930s it was necessary to repair those structures that could be saved and raze the rest. The WPA established a work camp on the post and worked on the post through 1940. All three of the CAC barracks were sold off by 1939 and three of the six officer quarters were salvaged by the WPA along with numerous support structures. In 1941 a massive building program took over and Fort Casey was transformed into a World War II post even before the war started. By June 1941 the post had added nine new 63 man barracks and three new mess halls. Officer quarters were added and the existing quarters upgraded. 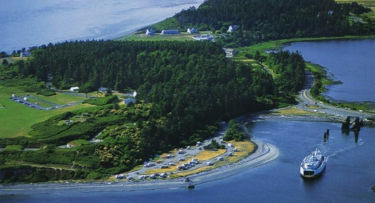 Fort Casey was reactivated during World War II again as an induction and training center. Two batteries were modified to hold 3" anti-aircraft batteries. Surprisingly, all of the 10" and 12" guns were dismounted and scrapped late in 1942 as a part of the first large scale, quota driven, scrap drive of World War II. All of the scrapped guns and carriage belonged to disappearing carriage and mortar batteries which had become outgunned and outranged by shipboard armament. Battery Van Horne, Battery AMTB - Ebey's Landing and the three anti-aircraft guns were the only Fort Casey gun batteries that remained active through the end of the war (nothing larger than 3"). Placed in caretaker status by the US Army in 1950. Put up for sale by the General Services Administration in 1956 and acquired by the Washington State Parks and Recreation Commission. 1902-08-18 1902-09-22 Capt. Lewis, Isaac N. 3031 Cullum's Register has him remaining in command until October 1903. 1903-10-08 1905-12-20 Maj. Walker, Leverett H. 2385 Cullum's Register gives the dates of his command as Oct. 3, 1903 to Apr. 2, 1906 but noting that he was "on leave in Japan Dec. 14, 1905 to April 2, 1906". 1903-10-12 1904-01 Capt. Alexander, Walter Stone 2766 Dates of command are from Cullum's Register but directly contradict the dates of the preceding, also from the Register. The brief command was probably during a leave of the preceding. 1907-04 1907-06-15 Lt. Col. Niles, Lotus 2554 Cullum's Register has him assuming command on Feb. 12, 1907. Now 467 acre Fort Casey State Park. Some of the original 1904 post buildings remain and most of the 1941 World War II buildings remain. Battery Worth (1) has two 10" guns with disappearing carriages on display that were obtained in 1967 (1963) from Battery Warwick, Fort Wint, Subic Bay, Philippines. Battery Trevor also has two 3" rapid fire pedestal guns on display, both from Battery Flake, Fort Wint, Subic Bay, Philippines installed in 1960. This page was last modified 14:07, 5 February 2019 by John Stanton. Based on work by Jonathan Nelson and Bill Thayer.